Exit strategies for both covered call writing and selling cash-secured puts is one of the three required skills for maximizing investment returns. Whether we are mitigating losses, turning losses into gains or enhancing winning positions to even higher levels, we must have the capability to take advantage of all position management opportunities. 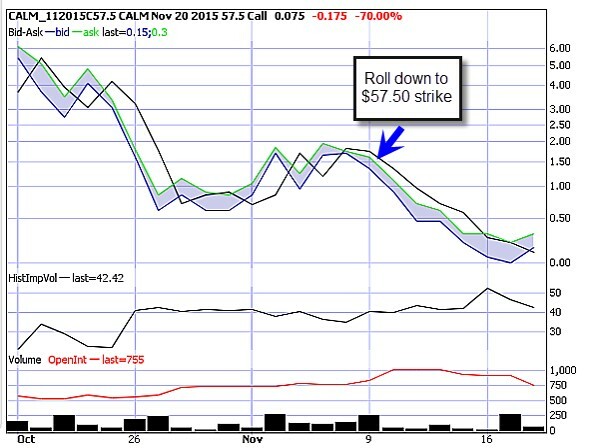 In this week’s article I will highlight a rolling down strategy I used in my personal portfolio for the November contracts for Cal-Maine Foods, Inc. (CALM). Rolling down ten days prior to contract expiration allowed us to generate a higher premium than the cost-to-close ($1.40 versus $0.80) and afford us some downside protection. This is an excellent example of how we should always be prepared with a secondary exit strategy plan (rolling down) if our initial plan (“hitting a double”) cannot be implemented. After entering our option-selling trades we must immediately enter into “position management mode” Most of the time exit strategy execution will not be necessary but when it is, it is imperative we take advantage of these opportunities. In the case of CALM for the November contracts, we used covered call writing, our 20% guideline and then the rolling down strategy to turn a share loss of $3.25 per share into a net position gain of $2.08 per share. 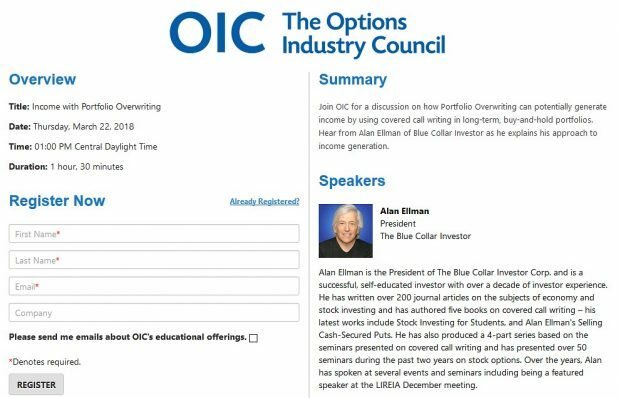 Mastering all three of the required skills (stock selection, option selection and position management) is what sets Blue Collar Investors apart from all the other option-sellers. “The Fed will not raise interest rates in December. Retail sales will be flat or rise slightly. The dollar will rise in value relative to the Euro and other major global currencies”. Thanks for the great response we’ve had to this event. Keep those entry forms coming. We allow two per email address and the deadline is November 30th. I am in discussion with other investment groups throughout the country and expect my 2016 calendar to be fully booked in the very near future. Thanks to all of our members for making this possible. Real average hourly earnings climbed 0.2% in October and were up 2.4% from October, 2014. For the week, the S&P 500 rose by 3.27% for a year to date return of 1.47%. BCI: Cautiously bullish using an equal number of in-the-money and out-of-the-money strikes. I remain fully invested using 50% in-the-money strikes until the Fed makes its position on interest rates known and evaluating the ensuing market reaction. I believe that most institutional investors have factored in a 25 basis point rate hike with moderating guidance from the December Fed meeting. Alan, I have seen the latest Schedule-D pages but there is no returns given for options expiring worthless (code 4), but why is this? When we write a covered call the sale date is always prior to the acquisition date. If we bought back the option, that date would represent the acquisition date and our cost basis (denominator in % returns). In this case the option expires worthless at expiration or the acquisition date. However, the acquisition price is 0 and, by definition, you cannot have 0 in a denominator and so % returns cannot be calculated….that’s why “NA” in those columns. This week’s Weekly Stock Screen and Watch List has been uploaded to The Blue Collar Investor Premium Member site and is available for download in the “Reports” section. Look for the report dated 11/20/15. Open interest (OI) has to do with option liquidity. Our guideline is that we would like to see an OI of 100 contracts or more and/or a bid-ask spread of $0.30 or less. We can also “negotiate” with the market-makers leveraging the “Show or Fill Rule” (see pages 225-227 of the Classic version of the Complete Encyclopedia…). When OI does not meet this guideline it frequently results in a wide bid-ask spread putting us in a potential unfavorable position should we need to buy back an option. This is a risk-reducing guideline. my timing with CALM was not so good. I bought on 10/05 @ 59.87 and sold the 10/16 60.00 calls for 1.47. On 10/09 I bought the calls back for 0.15. On 10/16 I sold the 11/20 60.00 calls for 1.86, and bought them back for 0.40 on 10/27. Finally, on 11.20, I sold the 12/18 60.00 calls for 1.35, and I’m waiting to see what will happen next week. Maybe I was too bullish on these trades, as I see that CALM has failed several screens on today’s Stock Screen, but I’m trying to learn more each day, and your articles are really very helpful. Thank you for sharing the evolution of this trade. You are great about doing that and it always helps the rest of us learn. As usual your modesty is over done! You bought at $59.87 and still hold at $56.77. You have 13 more cents possible if called at $60. In the mean time you have generated $5.11 in options and dividend reducing your cost basis $54.76 for a net positive position of $2.01 for a 3.3% gain to date in a stock that is down 5.2% since you bought it! I always follow the BCI method by the book, but I get uneasy when the ticker shows deterioration on the weekly Stock Screen after I made a bullish trade. Market assessment, chart technicals and personal risk tolerance helps us determine strike selection. I’m currently 50/50 with ITM and OTM strikes. Frequently, if I hold multiple contracts on the same security (usually the case) I will sell some ITM and some OTM using a ratio dictated by market conditions. For example, if I sell 7 contracts in a bearish market on a stock with mixed technicals, I may sell 5 ITM and 2 OTM. Each day I learn some more with you. 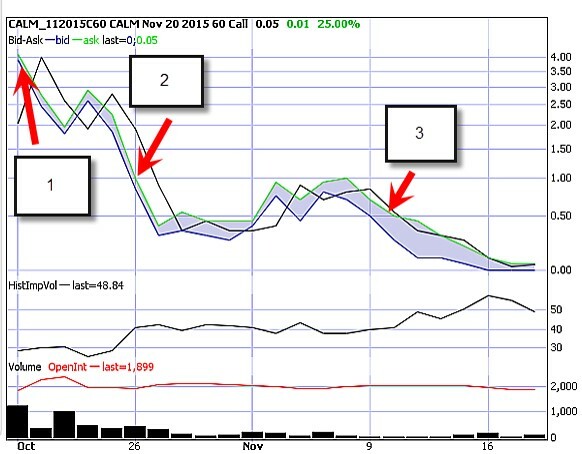 I like the option charts showing option price, OI, IV and volume in the Nov 21 post on CALM and rolling down. What app or website is that taken from? The basic chart is taken from Investools, a subscription service, and I then capture that chart and make additions using a software program to graphically finalize the points I am making. I own 100 shares of USO, paid 20 per share. Now they are around 13 per share, can I trade my way out of this hole using covered calls. The short answer is yes, covered call writing can be used to assist in recovery of significant share loss by writing slightly out-of-the-money calls and avoiding earnings reports. HOWEVER, before you move forward with this approach you must first decide if this is a stock you should remain loyal to. Are the reasons you purchased the stock originally still present? If yes, consider the above. If no, consider taking the cash currently in these positions and handing it over to a different security that does meet your requirements. I had owned CALM as well for November contracts but on 19th Oct I had instead initially sold the $62.50 Call. I thought it was breaking above resistance, as my buy price at the time was well above it at $61.65. It seemed to turn into a false breakout! I am wondering why did you go for the $60 strike instead of any higher one? Should I have sold an ITM $60 Call even though I had bought above past price highs? Did you really buy CALM on 19th, as lowest low that day was $60.50? Your return is over 6%, isn’t this too high? And I like yourself rolled down to $57.50Call, but I also rolled down further to the $55Call on 16th Nov.
I’m just trying to learn what I maybe could have done differently. 1- I used an ATM strike to generate the highest initial returns as it appeared that CALM was entering a period of consolidation. Plan B would have been an ITM strike but I really like the back story on this stock I(could be wrong). 2- I have owned this security prior to start of October contracts. I used highs of Friday’s close. 4- Rolling down a second time tells me that you are on the ball and on top of your positions. Again, no right or wrong here. You generated additional time value premium and downside protection. Did you roll the option? I’ve just come across your great website! What advantage(s) to gain in trading OPTIONS in comparaison with others securities (Forex, Futures…)? Welcome to the BCI community and thank you for the positive feedback. There is nothing wrong with trading derivatives of commodities and currencies if you have a thorough understanding as to how they work. The advantage of selling options on stocks and ETFs is that it is more intuitive for most retail investors. Most of us have a general understanding as to how stocks work. The next step would be to integrate options into the strategy. Also, our government allows for option-selling in self-directed IRA accounts. Whichever strategies are ultimately decided on, all aspects (selection of the underlying security, option selection and position management) must be mastered to achieve the highest levels of success. Do you think i need to dig deep into the equities world to be able to trade equities options successfully? Stock or ETF selection is one of the 3 required skills needed to achieve the highest levels of returns…where I would like all our members to be. We should have a general understanding as to how stocks work and an elite understanding as to how to select them specifically for option-selling. You do NOT need to read a myriad of articles about a company to accomplish this. The due-diligence required should be both time efficient and user-friendly. My “unbiased” opinion is to start with the BCI methodology and then tweak and tailor to your particular trading style. I listened this morning to an interesting 2016 commentary from a Goldman Sachs guy. It is getting towards year end so all the big houses will be in the prognostication business soon. His view is a sideways and stagnant 2016 characterized by rate hikes, weakness around the globe and earnings struggles here. Retail investors will remain on the sidelines and company stock buy backs will be the impetus for price appreciation. He did not say what institutions like his might do. Though he suggested US big caps, domestic growth names and limiting foreign exposure due to the dollar. I actually found it refreshing compared to the “Next year will be great” self promotion I usually hear from Wall Street about now! Thanks and in reply I didn’t rollout because I found not only was price performance a ‘No’ for me but this resulted in a loser trade. That was why I reckon I should have not rolled-down again, as I see my return would otherwise have been better. I want to ask you 3 questions I have thought of. Do we need to each time write down for ourselves why we actually wanted to enter a trade, and if so what else should we write down, apart from the usual trade details(I do make a note of certain mistakes made though)? A few months back the market dropped a lot and I had some stocks ready to trade that very morning. I am unsure or not that if see the S&P500 futures are down 1% or greater, then should I still be ready to put trades on(the next morning as wanted to), or wait a few hours maybe as the volatility first eases?, if I were to wait around then for how many hours should I? 1- Our general reasons for entering a trade relates to the stock passing our 3-pronged screening process and option returns meeting our goals. But there may be additional factors like an upcoming stock split, strengthening industry rank (information provided on our premium running list) etc. that we may choose to make note of. 2- I enter my trades between 11 AM AND 3 PM ET. This eliminates the early morning and later afternoon potential market volatility created by institutional computerized trading. Good observation. 3- I absolutely believe that we must be able to interpret price charts. That’s why I devote so much of my books and DVDs to technical analysis. In the classic version of the “Complete Encyclopedia…” I allotted 50 pages to this very important topic. My suggestion this week is to use out-of-the-money strikes for companies that produce turkeys, stuffing and cranberry sauce…perhaps weight-loss companies as well.